Want something exclusive and unique? Then look no further, ArtHOUSE Beachfront Accommodation has three exclusive private absolute beachfront apartments right on Emerald Beach and are great value for money! The ArtHOUSE's are all about location! Two fo the apartments are one bedroom and the other is our new two bedroom apartment. These are all listed on Stayz and are called ArtHOUSE No.1, No. 2 or No 3. They are ideal for couples, but can accommodate more. They are nestled amongst stunning tropical gardens, surrounded by National Park, and themed throughout with original artworks. We endeavour to create a space which is ultimately private, comfortable, inspiring, and homely. Come and stay, you will not be disappointed. Emerald Beach is a breathtakingly beautiful coastal village near Coffs Harbour, located on the north end of the tranquil Mid North Coast of NSW. Surrounded by the Solitary Islands Marine National Park, Emerald Beach has a lot to boast about. It is a nature lover’s paradise! Beautiful headlands are to be explored and a choice of many beaches to lie on depending on the breeze, AND a great whale watching, surfing, fishing, walking and relaxing destination. The village has everything you need, 2 fabulous licenced restaurants, an amazing pizza & pasta take-a-way, a general store, bottle shop and hair dressing salon. For those seeking a little luxury, and time together to laze away tranquil days in a stunningly beautiful location this studio is the perfect destination for a relaxed escape. Emerald Beach is far enough away from the hustle and bustle of Coffs Harbour, but close enough to enjoy what Coffs offers also. Coffs Harbour is a coastal city located on the north coast of New South Wales about 540 km (340 mi) north of Sydney, and 390 km (240 mi) south of Brisbane. Coffs has a population of 79000 people, it is a fast growing dynamic city full of things to do and see including the iconic Big Banana tourist attraction. According to the CSIRO, Coffs Harbour has the most liveable climate in Australia, and it is nestled between a high mountain backdrop and dozens of 'unspoilt' beaches. Average summer day temperature is 27 degrees celsius and the average winter day temperature 18 degrees celsius. The city has a university campus (Southern Cross University), a regional art gallery, famous boat marina, the Coffs Harbour Jetty - which is an historically important timber wharf where coastal shipping once moved the timber from the hinterland. Coffs also has a public and a private hospital, several radio and television stations, and three major shopping centres. Coffs Harbour is near numerous National Parks, including the Solitary Islands Marine National Park which Emerald Beach is in the heart of. There are multiple regular flights each day to Sydney, Brisbane. Coffs Harbour is also accessible by road, by CountryLink trains, and by regular bus services. Within 45 minutes west of Emerald Beach you can be exploring the hinterland of creativity, such places as Bellingen and Dorrigo where there is an abundance of art, markets, colour, food and amazing riverside views. Just 10 minutes north of Emerald Beach is the cultural town of Woolgoolga, where a quality selection of restaurants can be found, along with the convenience of a tavern, supermarket, banks, newsagents and a chemist, along with more great shopping. We pride ourselves in creating an quiet, exclusive, and totally private space for our guests to relax. We strive to obtain a 'point of difference' in design and concept. We like to stand out and be memorable. The gardens which surround the ArtHOUSE are the pride and passion of the owners. This garden has been and will continue to develop and change. It has been cleverly designed to withstand coastal weather but maintain privacy, colour and excitement. It supports diverse wildlife including our own Echidna, quails, wallabies, green tree frogs, to name a few! We hope that each guest takes away something more than just a holiday, we hope to inspire and please! Most definitely a beach view! Absolute beachfront location, hard to beat on the north coast of NSW. Most definitely an ocean view! Yes the ocean is right at your finger tips! What a beautiful place to stay. Beach views from the apartment, the sound of waves crashing as you sleep, cool sea breezes as you relax. 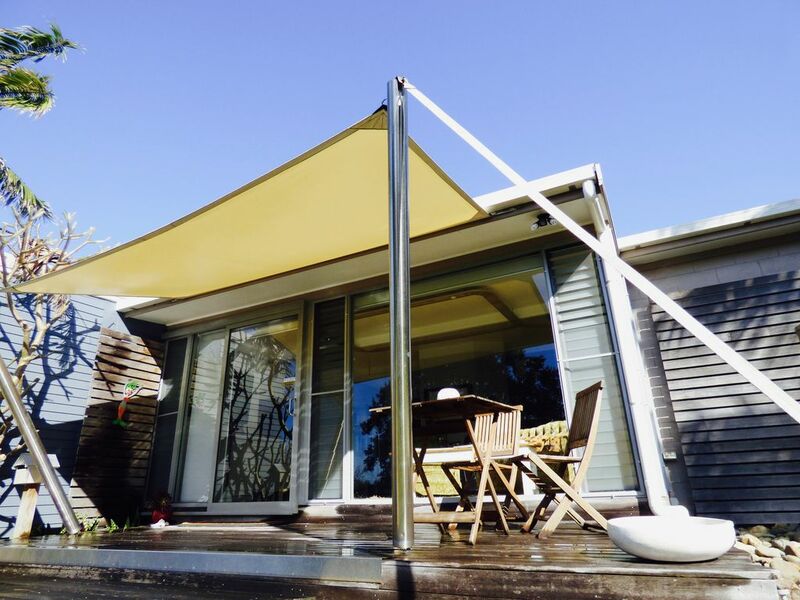 ArtHOUSE, Emerald Beach and surrounds have everything you need for a perfect beach holiday. We had a week of bliss and will not hesitate to return. Maryanne & Keith were lovely to deal with; very accommodating and easy to contact. I just wish we could have stayed longer! Maryanne, was more than helpful and put minds to rest that nothing was to much trouble, but on arrival she had taken that to the next level by making sure the little extra touches were in place, gift bag for the dog and other touches that didn't go unnoticed, thank you Maryanne, its the first time that I have come home from a holiday feeling there was nothing to complain about. This was our third visit to the ArtHouse and it stays just as amazing every time. Absolutely gorgeous location, beautifully curated accommodation. The owner, Maryanne, is always a pleasure to deal with. Hello Alisa, thanks for coming back!! and thanks for the very positive feedback. Hello, thanks for your positive feedback! Yes location location! We had a very relaxing 6 nights at Arthouse 2 which has just been finished so everything is nice and new. Great view from the verandah, nice furnishings and facilities. Felt very private even though we were near to the beach. We particularly enjoyed being able to go for coast walks straight from our accommodation and seeing kangaroos on the headland nearby. The beaches here are gorgeous and stretch for miles. Thanks for noticing the finer details! And happy that you had a good week at Emerald Beach. The coastal walks are definitely beautiful. A place with soomething a bit different to offer. A unique property with fantastic views. The ammenities were all that we could wish for to make our stay a relaxing one. Thanks for your positive feedback Peter!